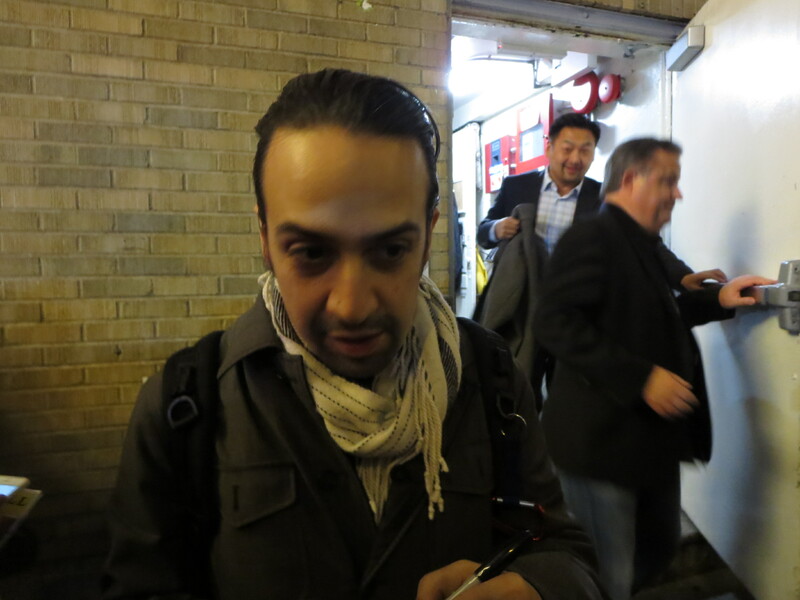 Lin‐Manuel Miranda signed my program. Before that, there was a show called Hamilton. Some folks say it’s one of the best shows to hit Broadway in a while, but I think they may be selling it short. I went in to the theatre tonight with very high expectations, having read Hamilton’s biography and listening to the cast album repeatedly. Not only were my expectations exceeded, but I never imagined any show could be this good. 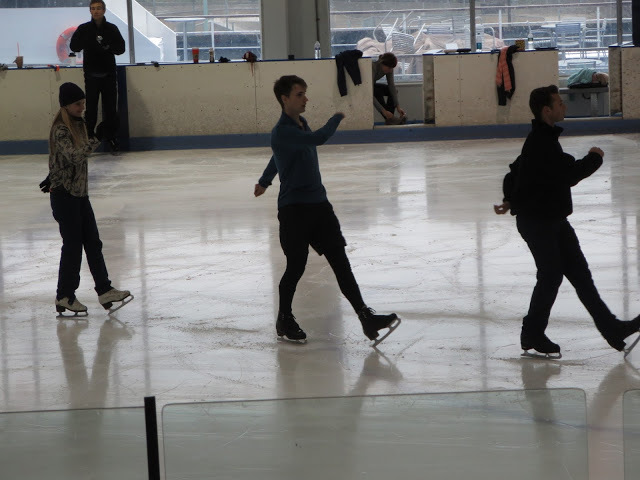 I have never seen a cast bring such unflagging energy to everything they did on stage for three hours. The staging was incredibly imaginative, the choreography was completely original and executed with exuberance. There was not a single actor/singer/dancer on stage who wasn’t brilliant. There was not a single scene that felt like filler, nor a single moment that wasn’t exactly, perfectly, as it should be. Before that, there was a slice of New York pizza, the first authentic New York pizza I’ve had in probably more than thirty years. After living in Illinois, I developed an appreciation for Chicago‐style pizza, and I may have admitted to preferring it over New York style. But I now have to revoke that judgment. This wasn’t even one of the top‐rated pizza places in New York, but the moment the first bit of grease dripped to the paper plate from the crease in the folded crust, the superiority of this style of pizza was confirmed. Before that, there was an afternoon spent at the Museum of Modern Art. 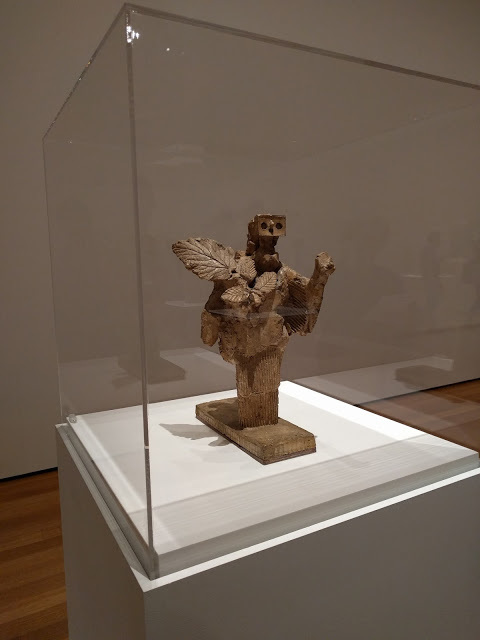 The Picasso sculpture exhibit was just stunning. 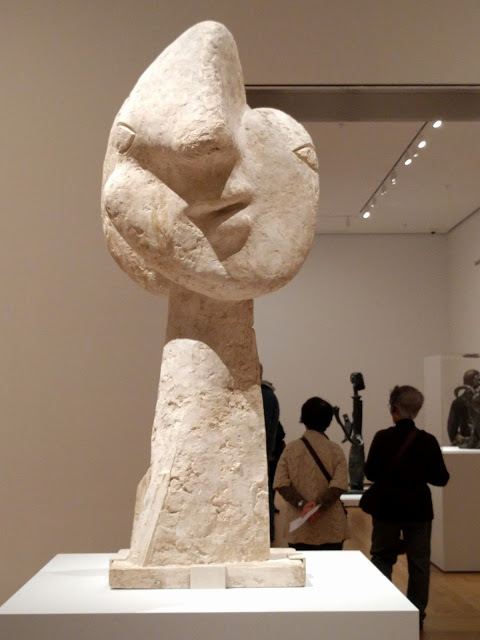 I was overwhelmed because I really only know Picasso as a painter, but his sculpture was every bit as masterful. I also saw some of the museum’s permanent collection. 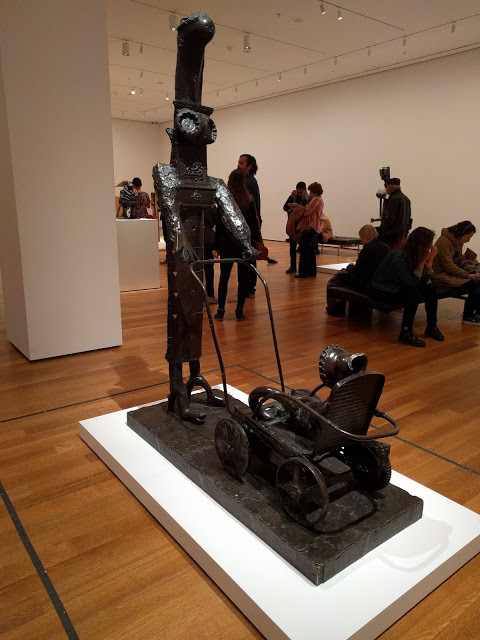 I wasn’t aware that MoMA has so much work of Impressionists, post‐Impressionists, and modern painters from Europe as well as North America. I guess I thought all the great paintings of Matisse and Cézanne and Van Gogh and Gauguin and Rousseau and Klimt and Chagall and Picasso and Mondrian and all the rest were in Europe. I also enjoyed a few other exhibits: Making Music Modern: Design for Ear and Eye, which included things such as radios and phonographs and other stereo components, plus LP album covers and posters; and This Is for Everyone: Design Experiments for the Common Good, which had everyday objects and iconic symbols that are familiar, from furniture to a jar opener to the Google Maps pushpin symbol. 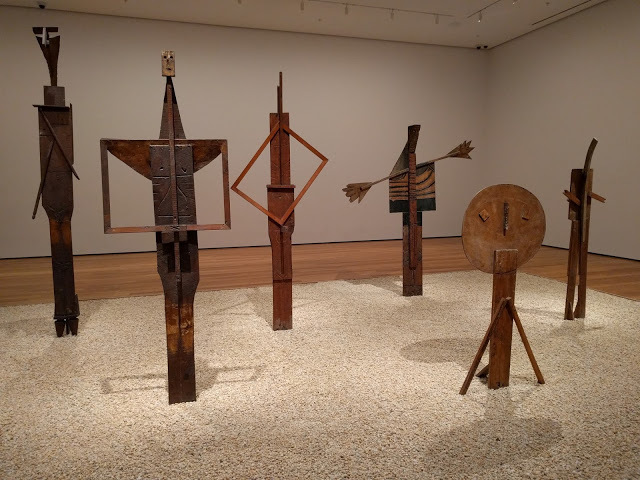 According to the audio guide, the idea of sculpture in which empty space is as much part of the work as the material was a concept that Picasso originated. Prior to this, sculpture was about the use of solid materials. 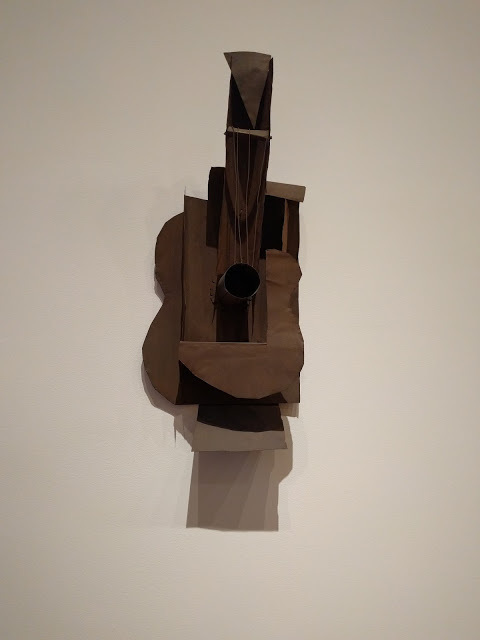 When Picasso created this guitar, he didn’t know anything about working with metal, so he did it without welding. The pieces are attached with wire. Picasso did a lot of work in plaster during the 1920s and 30s. This piece and several others were remarkable by how different they look as you walk around them. Picasso used corrugated cardboard pressed into the plaster to create the pleated skirt effect, and did the same with actual leaves. 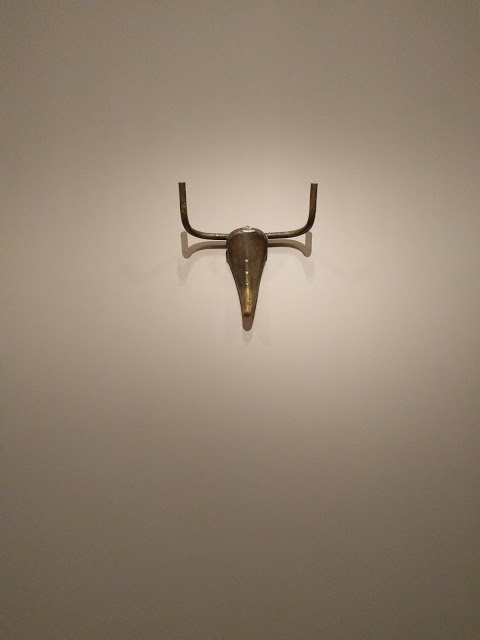 This bull’s head is made from a bicycle seat and handlebars. I love how proud the papa looks. Fatherhood must have agreed with Picasso. 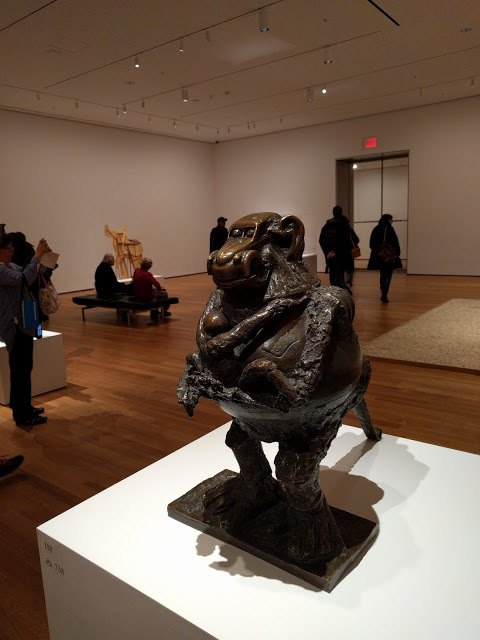 The head of this monkey is made from a toy car. These bathers are all made from scrap wood, including some discarded picture frames. Before that I had lunch at Chelsea Market. 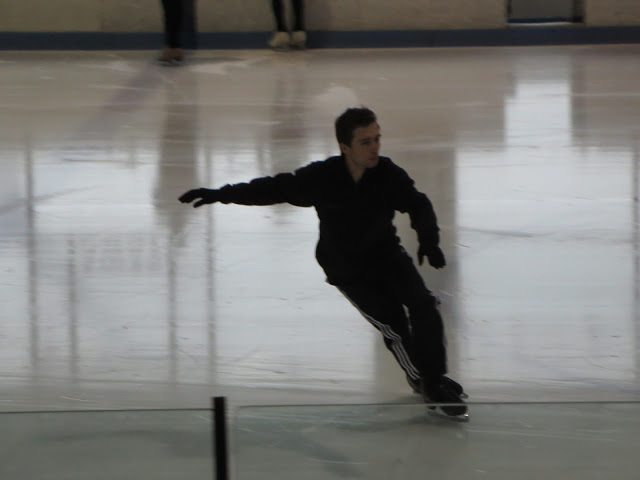 Before that I went to Chelsea Piers and watched some figure skaters practicing at the ice rink. Before that I visited a few galleries on . Some interesting art. 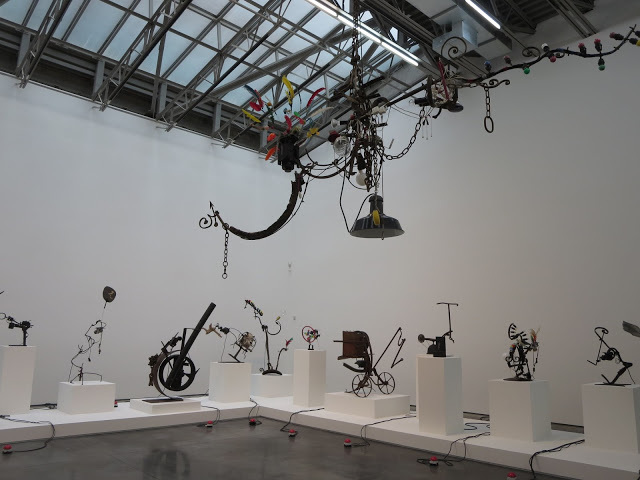 These are kinetic sculptures. You step on the red buttons to operate them. 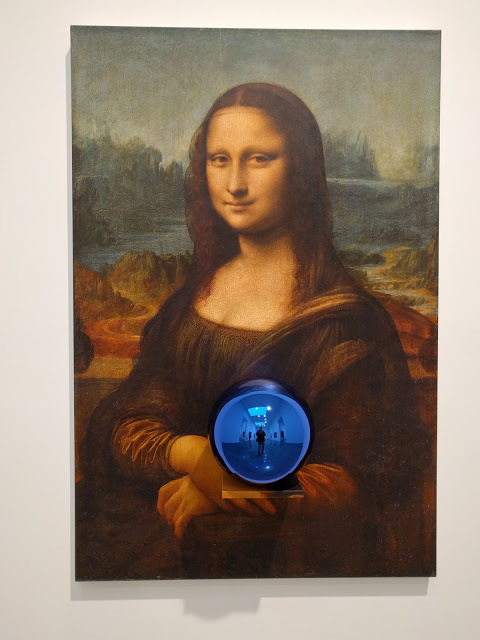 At one gallery the work was all reproductions of famous paintings with a shiny blue globe in front. Before that was waking up. Before that was what I forgot to write about yesterday: a night out after the theatre with my sister’s high school friend (and my high school friend’s sister) Linda, who lives just a few blocks from where I’m staying. She took me to a very crowded piano bar in the Village where everyone knew the words to all the show tunes better than we did. Wow!! so jealous of every single bit of your day.